This furnace stack was named "Isabella" and was built in 1858 and was the second of three stacks. 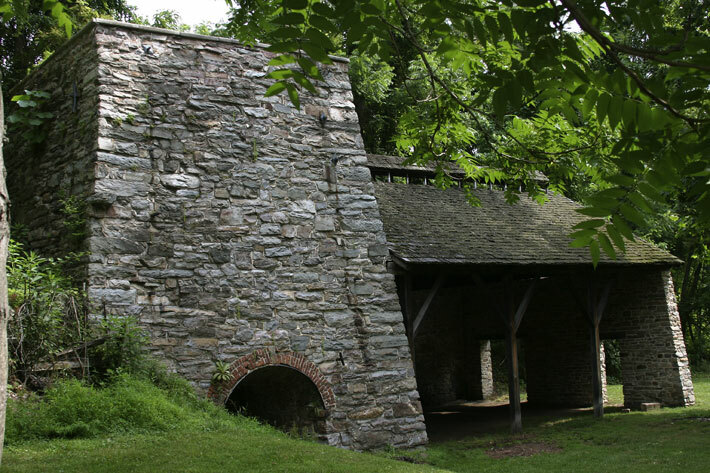 The first furnace, built in 1776, was probably located behind "Isabella" and used water power from Little Hunting Creek to operate its bellows. All 3 furnaces had different capacities and "Isabella" produced up to 3300 tons of pig iron annually. The state roadside sign says: "Catoctin: An important iron furnace during the Revolution owned by Governor Thomas Johnson and his brothers. Furnished 100 tons of shells used at Yorktown." This is said to be the only surviving iron furnace. Making iron was a major industry in early America and used for everything from eating utensils to nails. The beginning of steel production spelled the end for iron.